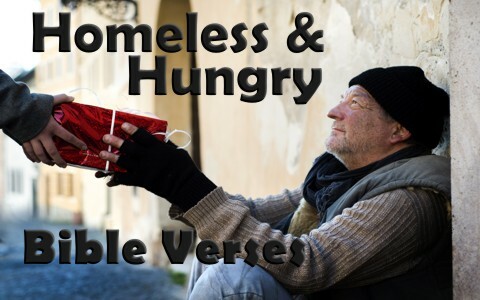 Here are ten encouraging Bible verses for the homeless and hungry. Remember the account of the rich man and Lazarus? The rich man must have walked past Lazarus day after day and saw this poor beggar man but did nothing to help him. After death it seems the positions of both are switched. The poor man is now in Paradise or in the “bosom of Abraham” but the rich man is in torment and in thirst amidst the flames of fire. He remembers his life and now wants to warn his family but it is far too late because he oppressed the poor so long that he insulted his Maker and after his death, came his judgment (Heb 9:27). The Old Testament laws are so much superior than the welfare system we have today because the law told those that lived in the land that they must “open wide your hand to your brother” but also “to the needy and the poor, in your land.” This law never limits the giving to only our neighbors and brothers but to everyone who is in need. This is one of the most precious promises of the Word of God. He declares that the righteous will not go hungry,” but we don’t know when this hunger is satisfied. Jesus said “Blessed are those who hunger and thirst for righteousness, for they shall be satisfied” (Matt 5:6) but those blessings may not come in this life but in the life to come. Twice we hear about the fear of God which isn’t a fear of being struck down immediately if you do the wrong thing; rather it’s a deep, abiding, holiness and reverence for God’s Word and for His name. Even if His creatures suffer want, “those who seek the LORD lack no good thing.” I have heard some very amazing accounts where someone went from homelessness and hunger to helping the homeless with their hunger. The Lord will reward each of those who have trusted in Christ and the psalmist knew that for him, “You prepare a table before me in the presence of my enemies; you anoint my head with oil; my cup overflows” (Psalm 23:5). At the time that this was written, if you were a guest, the host would keep filling your cup so a cup that overflows means, you are there forever. You will have no want or need if Christ is your Shepherd, even if that need does not completely come until the kingdom arrives. This powerful chapter four of Philippians has Paul encouraging the church by writing “I know how to be brought low, and I know how to abound. In any and every circumstance, I have learned the secret of facing plenty and hunger, abundance and need. I can do all things through him who strengthens me” (Phil 2:12-13) but he had to learn how to be content in such circumstances (Phil 2:11). In Matthew chapter 25 we read of a very powerful statement about what the Body of Christ, the church, should be doing. When we visit those who are sick, those in prison, feed the hungry, clothe the poor, Jesus says “Truly, I say to you, as you did it to one of the least of these my brothers, you did it to me” (Matt 25:40) so don’t think of it only as doing for others but in doing for others we are doing it for Christ. When people say that Jesus was homeless, we can point to this Bible verse, but this may not be saying that He is homeless but that He has no place to really call home because His kingdom is not of this world (John 18:36). Neither is this world our home as we’re strangers or pilgrims waiting for a better home, which is coming. Ezekiel the Prophet nails the cause of Sodom’s destruction. They did not help the poor and needy nor feed the hungry, even though they had “excess of food and prosperous ease.” When we withhold from those in need, God cannot withhold His righteous indignation for His ears are open to their cries and attentive to their pain (Psalm 34:15; 1 Pet 3:12). If you have ever been homeless and hungry, you know what it’s like to suffer want, but the Bible says that if you call out to Him, He “will incline [His] ear” toward you and “hear the desire of” your afflicted heart. Sometimes God allows us to suffer the consequences of our actions but other times we’re innocent victims of circumstances and simply suffer because we live in a fallen, sinful world. If you know of a homeless center near you, why not offer the hope through the eternal, living Bread of Life Jesus Christ and offer them a drink from the Living Water which will never run dry. This well never runs out…this bread, never fails and it is available for all who come to Christ in faith in and trust in Him. Something else for you to read: What Does the Bible Say About Helping the Poor? This is a great cause toward which to point believers. Thanks, Jack! You are so kind Pastor John. Thank you sir. God Bless you Jack Wellman ~ My husband and I live in Galveston, Texas we are always working to feed the homeless and be a light into our community. This island has so many needs but, one by one God leads us to what we can do each day! Thank you for these words, it’s nice to hear them from others. Thank you Mr. Anderson. but as we both know, all glory goes to God for we have nothing that wasn’t given to us by God (1 Cor 4:7). THIS is a great way to spread Gods word. Next post: Who Was Jethro In The Bible?